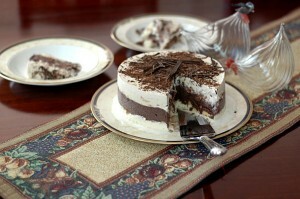 This is a beautiful dessert made so much easier by using Queen Gelato Mixes. Chop the glace fruit and soak in rum until needed. Prepare a pan sized to suit your family. I used a silicone sheet. Place 1½ inches of chocolate gelato over the cake crumbs and place in the freezer. Strain glace fruit and set aside. In a large bowl add the glace fruit and the reserved vanilla gelato and mix together. Fold in the whipped cream. Pour over the chocolate gelato layer, cover and freeze for 6 hours or overnight. Place on a plate and garnish with chocolate, pistachios, whipped cream or more glace fruit. I made a 20cm cake for the two of us and had plenty of both chocolate and vanilla gelato left over so a much larger cassata could have been made.